A little “Marmalade Meadows” stitching finish! Hello Friends – and Happy Wednesday to you! I hope you are well. I turned a little simple cross-stitched piece that I completed in the car at the school parking lot…. … into a little hanging pillow. The moral story is: Sometimes simple = sweet. 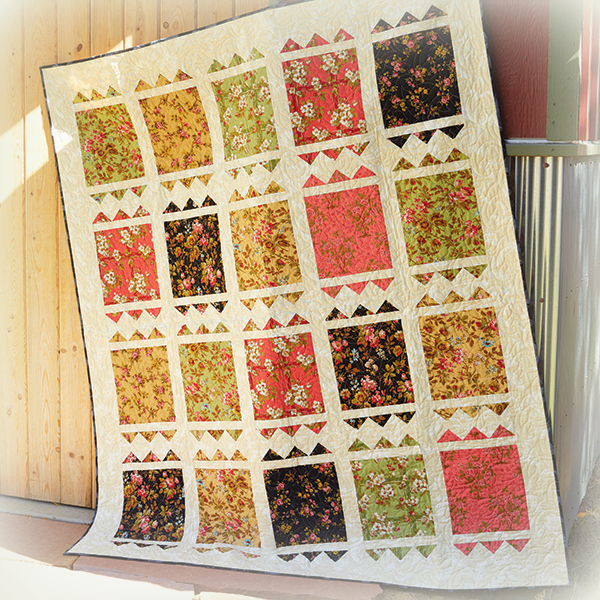 The colors I used are from my Marmalade Meadows collection. And more projects using this floss collection are forthcoming!!! I am working hard! I shall catch up with you later. Meanwhile, I hope you will keep sewing/stitching/quilting on! Hugs to you all! Hello Friends, Happy Monday, and a Blessed Week to you! 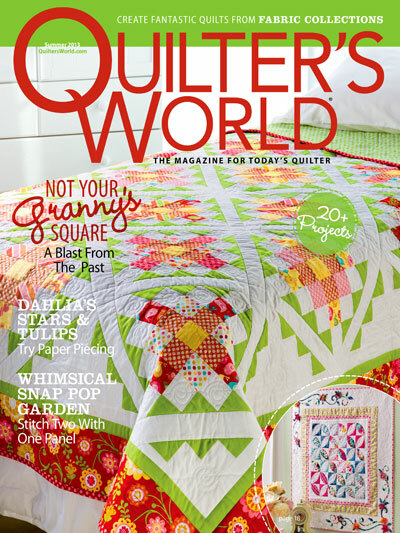 Today, I am sharing with you my latest magazine quilt that became official, Stamp Pad. 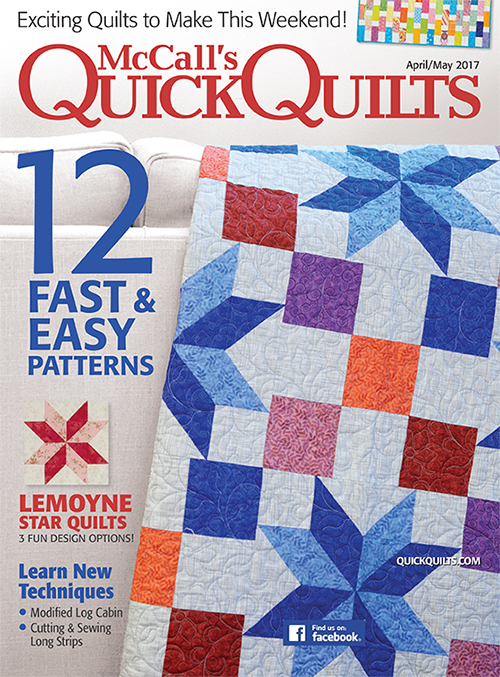 Stamp Pad is featured in McCall’s Quick Quilts (April/May 2017) issue. The full instructions are included in the magazine issue. This is a design that majors in the basics — flying geese and rectangular patches — and yet, the result is quite eye-catching, no? This design is perfect for telling a “fabric story” with any large or colorful prints. 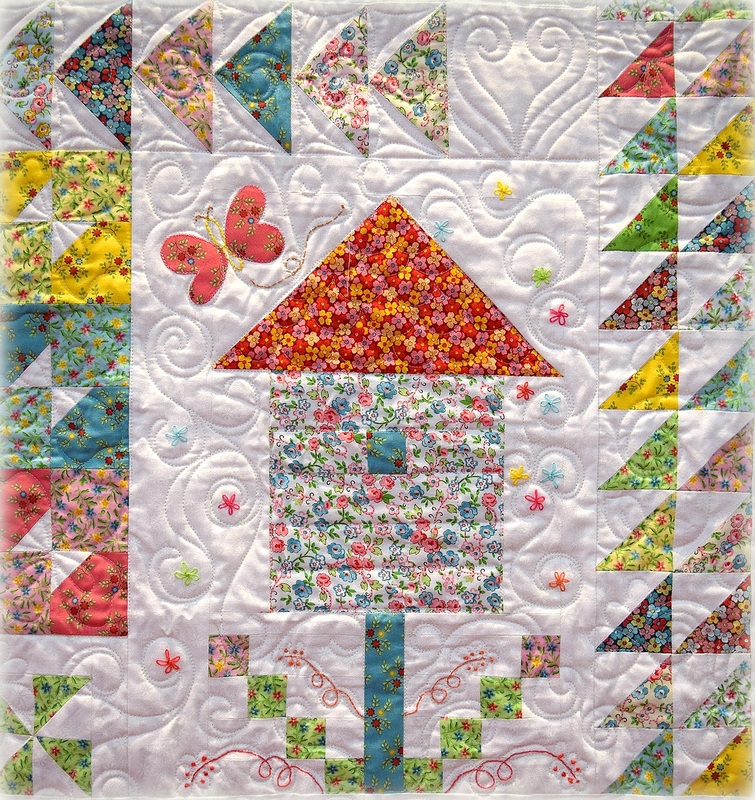 But if you interested to use the fabrics I used, they are from RJR Fabrics‘ Garden Gate line by Robyn Pandolph. Pandolph always has the most amazing florals!! 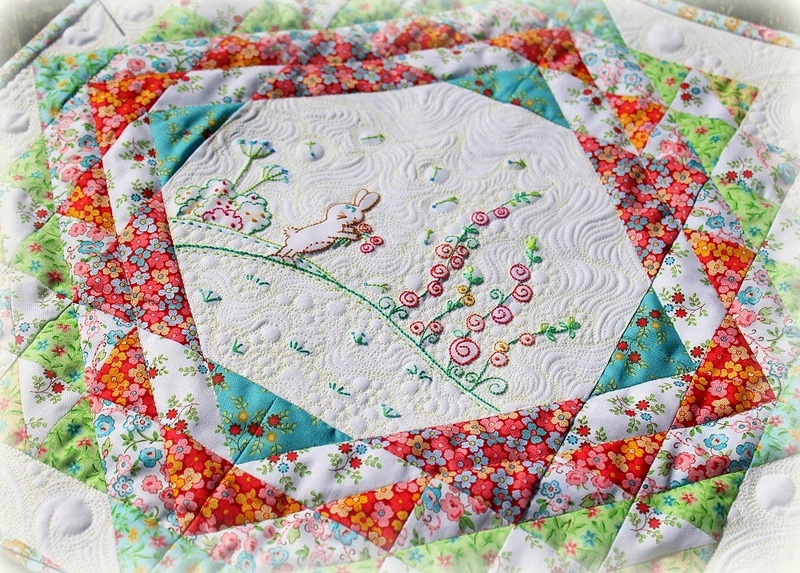 I have also designed an exclusive runner project using the same fabrics for Keepsake Quilting. Purchase the kit here, or purchase the pattern here. 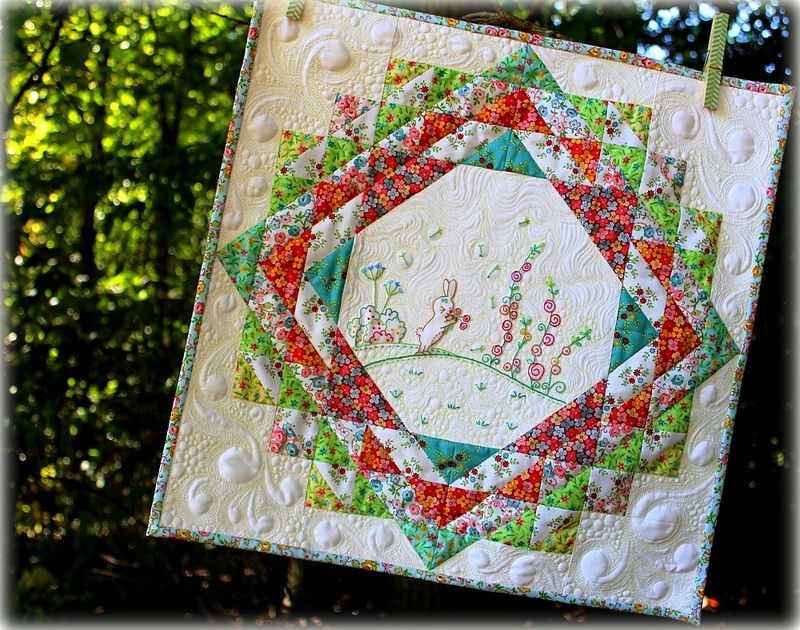 Be sure to check out my other offerings in Keepsake Quilting here. Meanwhile, I want to welcome those of you who have recently signed up to join the Spring on Bleecker Street Sew-Along. I am so glad you are on board. 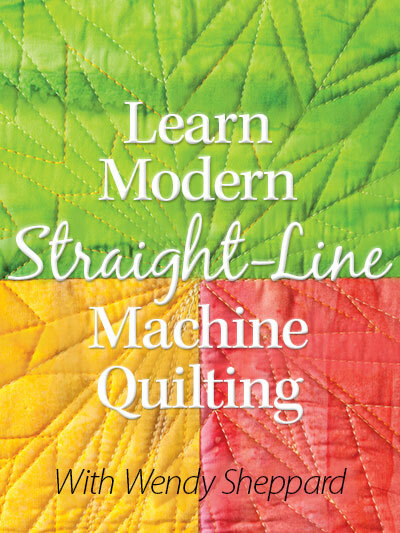 Click here if you would like to learn more about the Sew-Along. 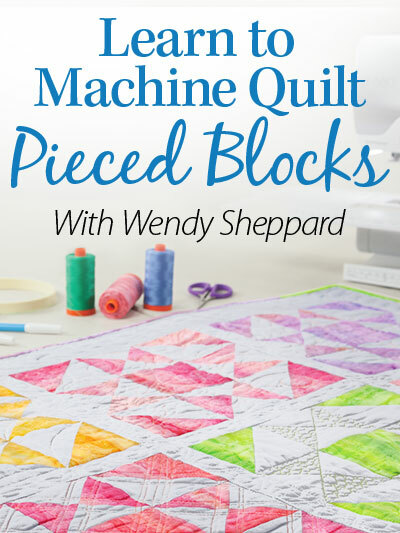 Again, like I have told many, I am running this Sew-Along with the pace of one who has way too many projects going on at the same time. So, we will just be tackling small portions of the quilt each month. The house/tree block took me 2 hours to complete… so, if you could just spare about 2 hours a month, I am certain you can keep up. 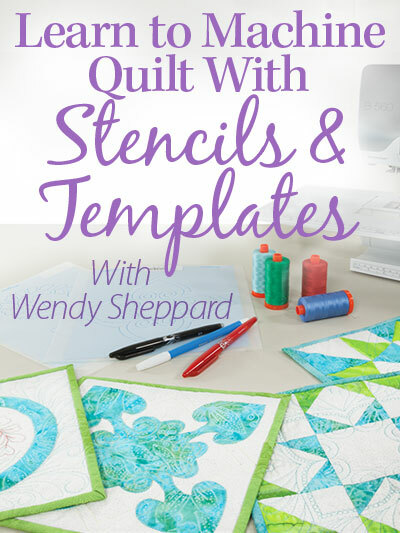 :)Also, I found out this week Cinnamon’s Quilt Shop has the kits if you need to pick one up. 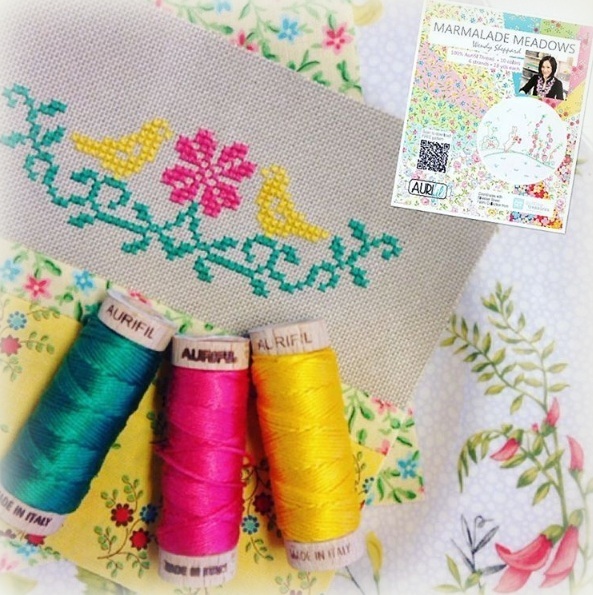 Click here to purchase the kits, and here to purchase the accompany Aurifil embroidery floss pack! 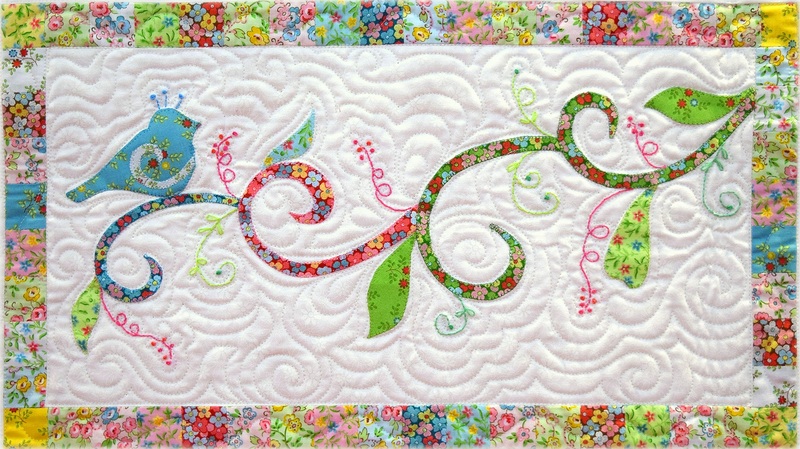 I will be posting installment #2 of the sew-along on March 15th. So, you definitely have time to catch up with part 1. :) Click here if you haven’t seen installment #1. Meanwhile, I have also been smocking. Miss Baby still lets me dress her, mainly because she is not one who puts too much thought into what she wears. It’s a win-win for us right now. She is needed some new outfits. So, here is my latest completed smocking project. And here, I completed the stitching for a small little project that I work on at the school parking lot when I wait to pick up Miss Baby. The colors I use are from my Marmalade Meadows floss pack. 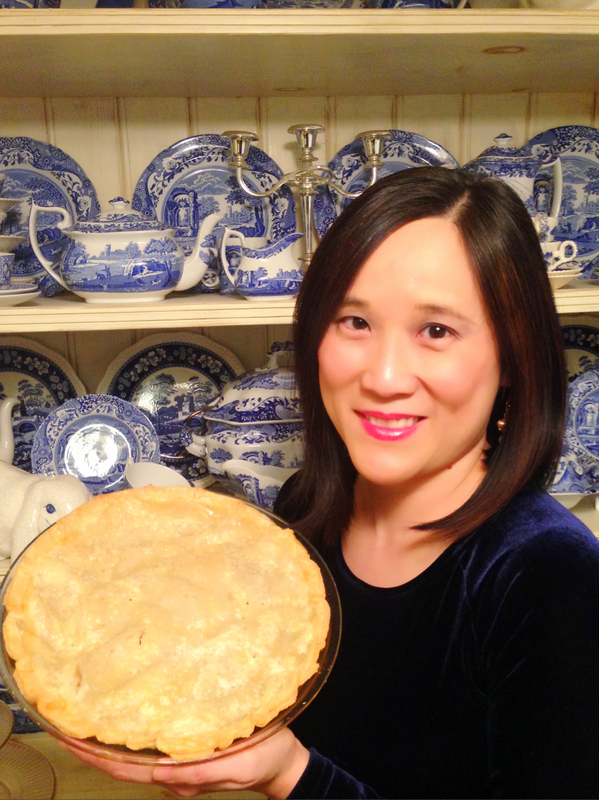 And here is me and a homemade apple pie a couple of weeks ago. I am not crazy about pictures taken of me, but I had to do it for one of the fabric companies, hahaha. Miss Baby can handily consume an apple pie in half a day, if I let her… a pinch of nutmeg is my secret ingredient when I make apple pies! :) That pie looks a bit pale because I was scared to death the pie would look too brown for the picture, hahaha. Truth be known, I popped that pie back into the oven after the picture was taken. Things I do for work…. But I am curious though — what is your favorite pie? And that’s it for now! I shall catch up with you again in a couple of days. Hugs to you all! 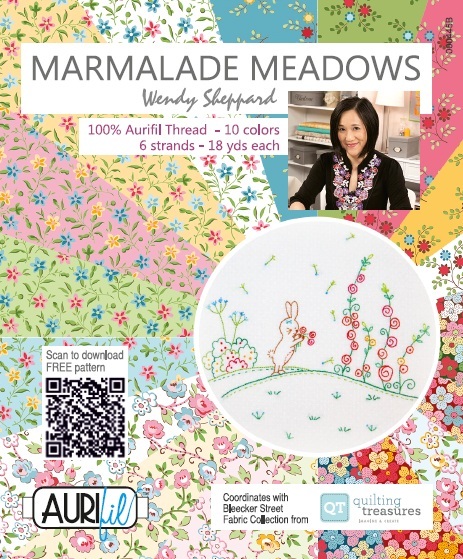 Last fall, Aurifil introduced my Marmalade Meadows Floss Collectionat Fall Market. 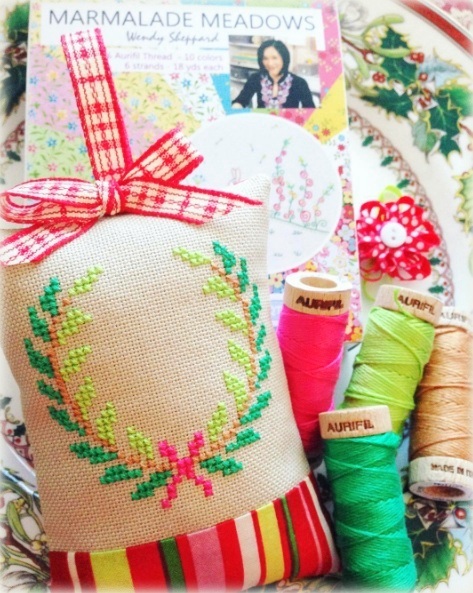 A few days before Christmas last year, Aurifil featured my new Embroidery Floss collection, Marmalade Meadows, on their blog Auribuzz. Click here to read more if you hadn’t had a chance to do so. Miss Baby: Urm, Mom, didn’t you tell them I drew the original picture? Miss Baby: Why isn’t my name on the box? 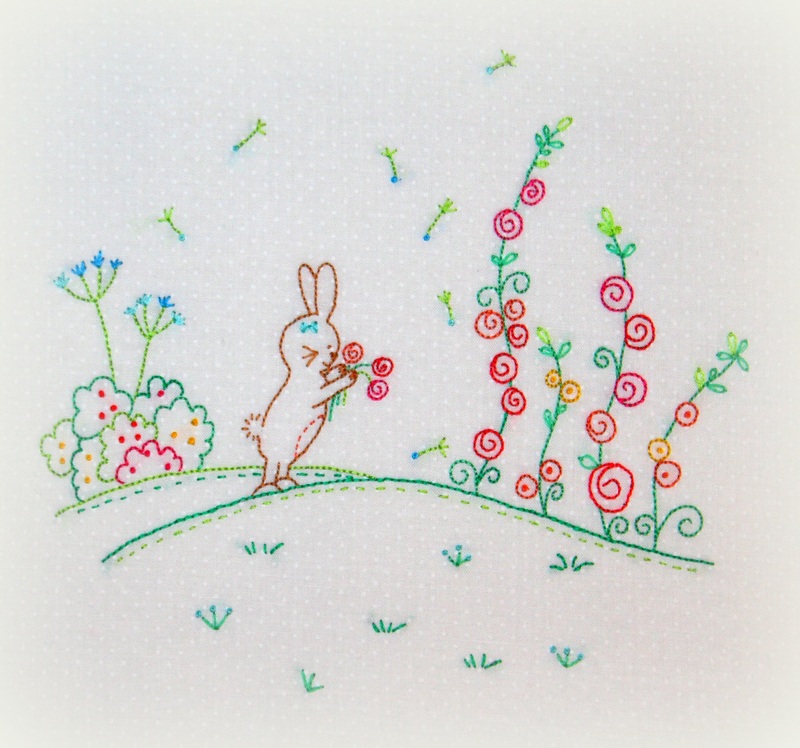 Over the next year, I will be releasing more Marmalade the pot belly bunny embroidery designs, as well as different projects you can make using the free download Marmalade’s Merriment embroidery design! It will be fun. 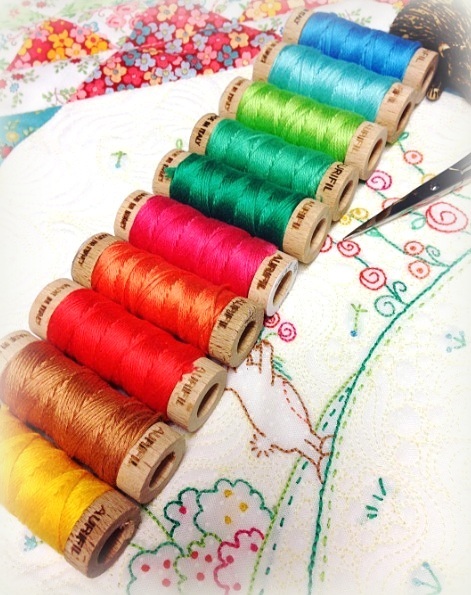 So, get your floss ready to stitch… You can ask your local quilt shop owners to order the floss collection for you! 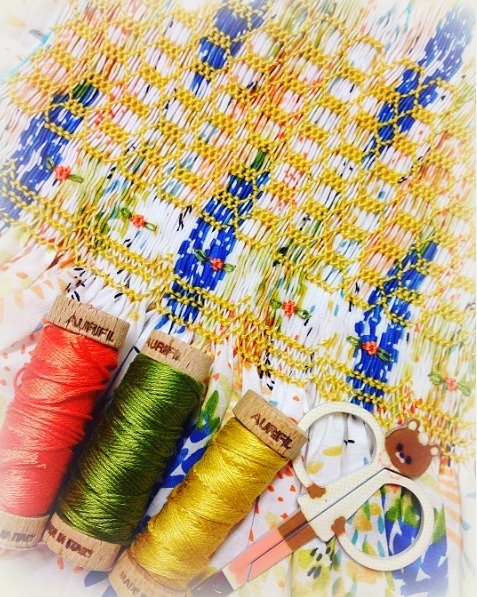 Aurifil is hosting another giveaway of Marmalade Meadows on their Instagram feed! 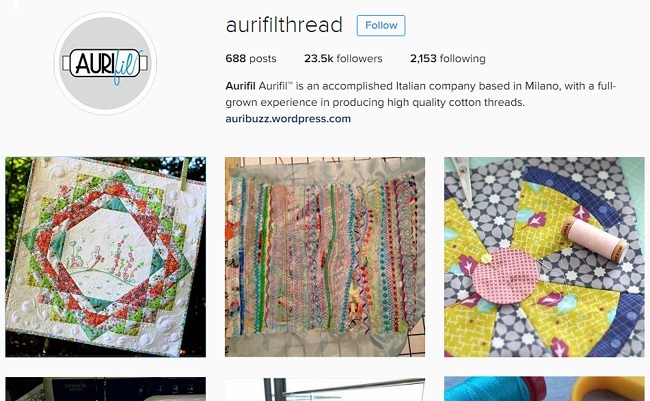 Be sure to check out the details there — just search for “aurifilthread”. That’s all for now, Friends! Happy Monday and Happy Week! I will be back this Wed to catch up with you! Hugs!!! Friends, you know I have a passion for handwork. 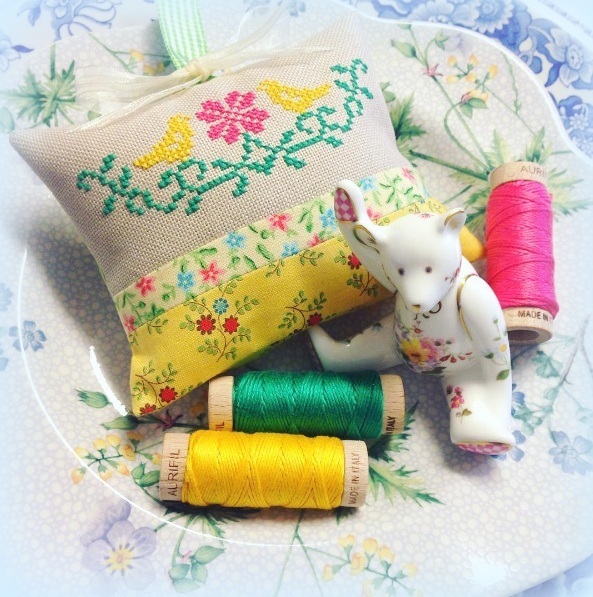 Over the years I have done embroidery, smocking and cross-stitching. I love stitching with my hands, and feeling the needle and threads as the stitches are formed. I am very excited to share more about Marmalade Meadows, an embroidery floss collection I curated for Aurifil. 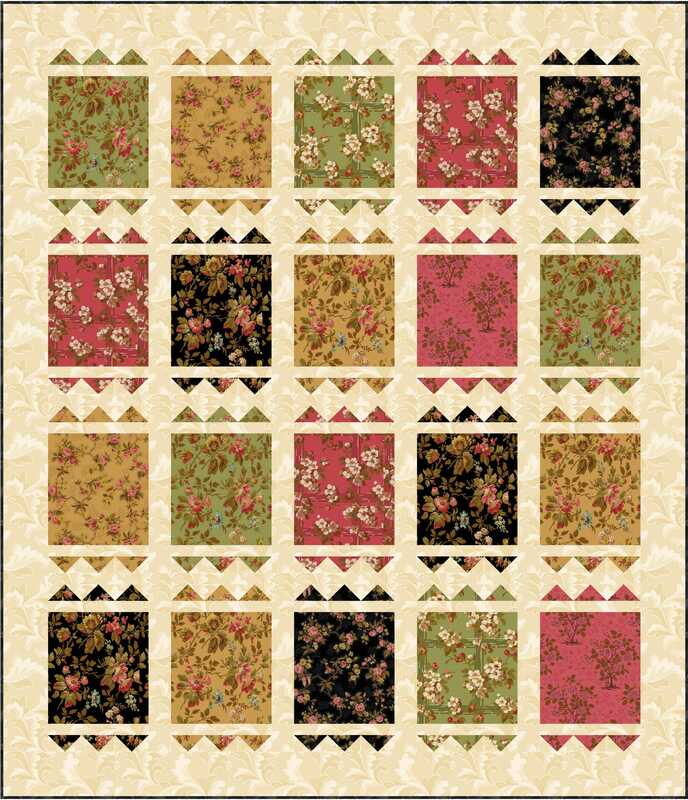 Firstly, these Aurifloss colors were selected to be companion threads for Quilting Treasures’ new group Bleecker Street! I will share more about Bleecker Street fabrics tomorrow. 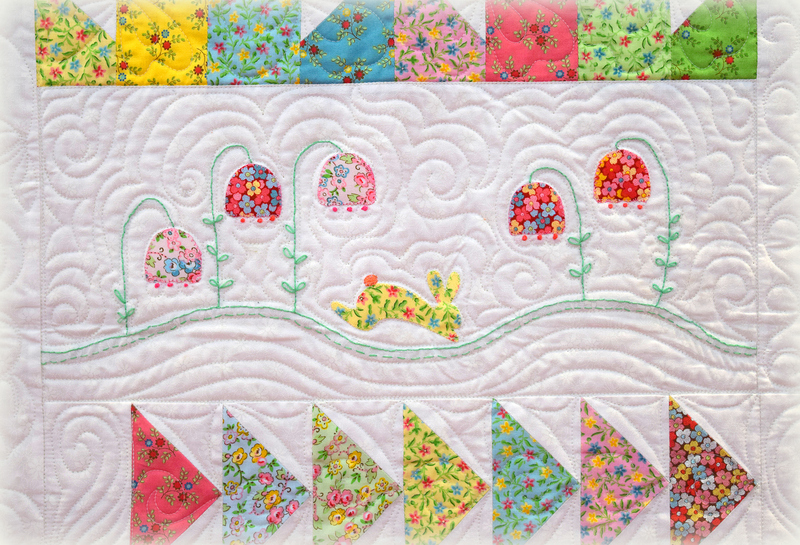 Spring on Bleecker Street is a collage quilt I designed using the Bleecker Street fabrics that involve a bit of piecing, applique as well as hand embroidery. The hand embroidery part uses threads from Marmalade Meadows. 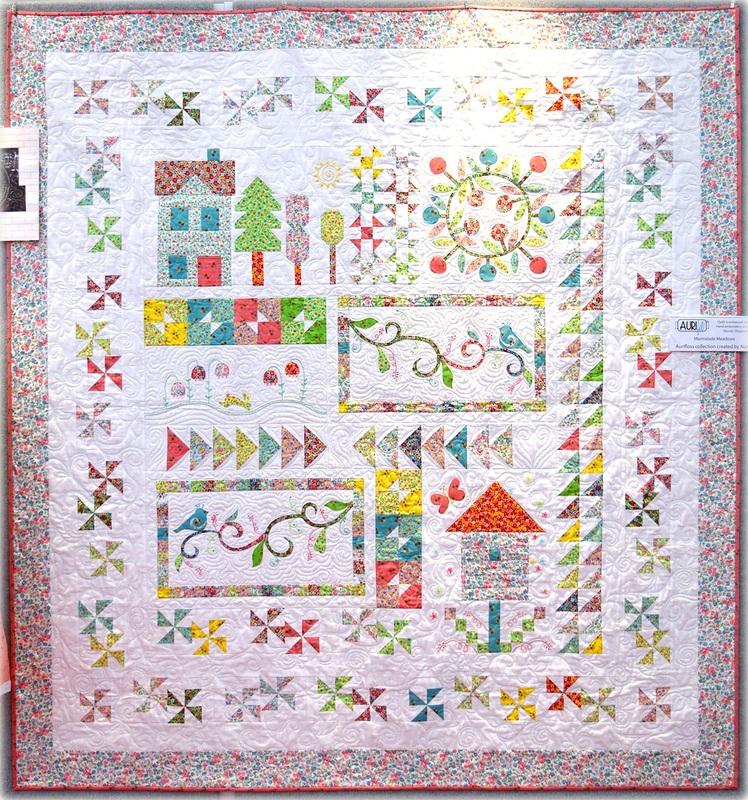 The following picture was taken at this past Quilt Market of Spring on Bleecker Street. 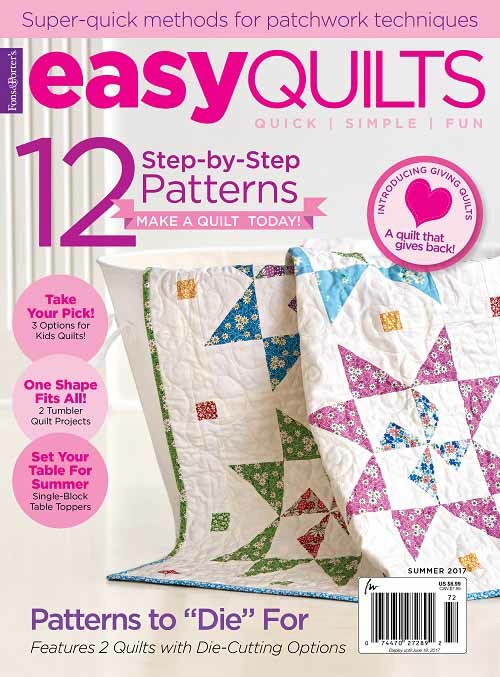 Kits and patterns are available via your local quilt shops sometime in November! 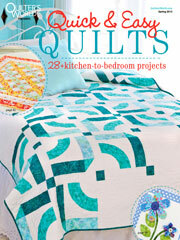 Check and ask about the project with your local quilt shops that carry Quilting Treasures fabrics. I also designed and stitched a little wallhanging using the Marmalade Meadows embroidery floss, featuring Marmalade, the pot-belly bunny! This is going to be a free pattern when the thread collection ships in December. I quilted the wallhanging with Aurifil’s Mako 50 wt cotton. 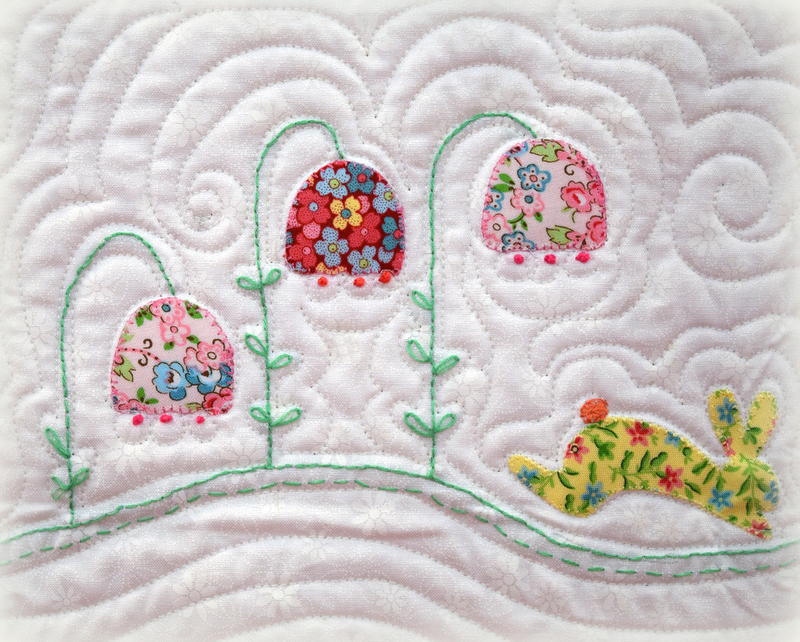 When quilting around embroidered motif, I like to quilt densely so that the embroidery will pop! Again, the collection ships this December to shops. 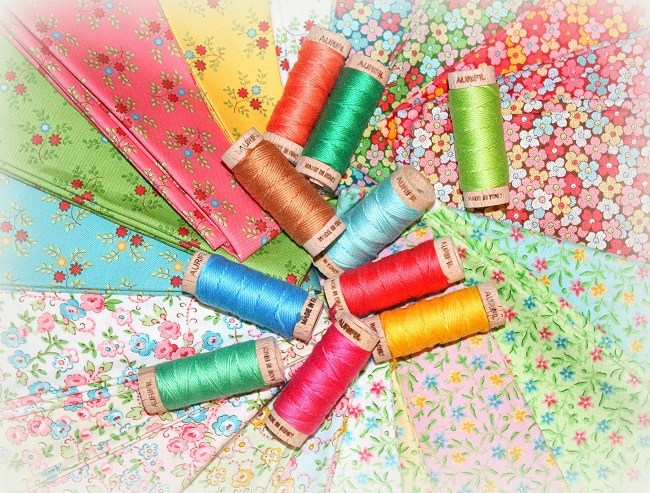 You may place an order for the collection with any shops that carries Aurifil products. I know http://www.followthatthread.com will have it. If it’s not listed on the website, just shoot them an email, and they will take care of you! Thanks so much for stopping by. Till next time!